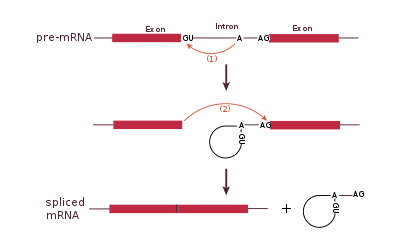 RNA splicing, in molecular biology, is a form of RNA processing in which a newly made precursor messenger RNA (pre-mRNA) transcript is transformed into a mature messenger RNA (mRNA). During splicing, introns are removed and exons are joined together. For nuclear-encoded genes, splicing takes place within the nucleus either during or immediately after transcription. For those eukaryotic genes that contain introns, splicing is usually required in order to create an mRNA molecule that can be translated into protein. For many eukaryotic introns, splicing is carried out in a series of reactions which are catalyzed by the spliceosome, a complex of small nuclear ribonucleo proteins (snRNPs). Self-splicing introns, or ribozymes capable of catalyzing their own excision from their parent RNA molecule, also exist. ^ Corvelo, André; Hallegger, Martina; Smith, Christopher W. J.; Eyras, Eduardo (2010). Meyer, Irmtraud M (ed.). "Genome-Wide Association between Branch Point Properties and Alternative Splicing". PLoS Computational Biology. 6 (11): e1001016. Bibcode:2010PLSCB...6E1016C. doi:10.1371/journal.pcbi.1001016. PMC 2991248. PMID 21124863.